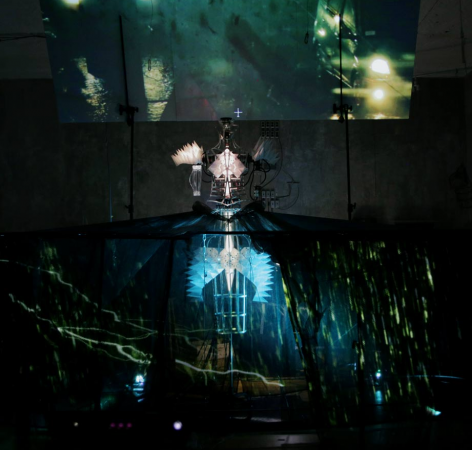 The John & Mable Ringling Museum of Art will debut Toni Dove: Embodied Machines, the first survey of Dove’s pioneering work, which operates at the crossroads of live performance, interactive narrative, and virtual reality. The exhibition will explore more than 20 years of the artist’s projects, from early installations through her interactive cinema and stage performances and concluding with her most recent experiments at the forefront of digital technology and robotics. Based in New York, Dove has been credited as one of the innovators of “interactive cinema.” Since the early 1990s, she has been interested in creating immersive experiences where the boundary between viewer and performer is blurred and the history of consumer culture and capitalism is examined. Dove’s collaborative practice brings together vanguard visual artists, filmmakers, fashion designers, robotics engineers, computer programmers, musicians, actors and writers. Dove, acting as the creative architect of experience, transforms the traditional artist studio system into a 21st-century idea incubator, using the work of art to inform technology.